GRAINS OF SAND is a collaborative work by Jim Salhany and Randy Andropolis. Jim and Randy met as teens, played in several groups together and became a songwriting team in the process. Many long nights were spent in the backroom of the J&J Restaurant in Niagara Falls, New York where they honed their craft and recorded the results. Now, many years later, Grains of Sand represents decades of joint music-making. Most songs on the album were co-authored, with Jim providing music and Randy the lyrics. The remaining songs were individually written. Jim and Randy play all instruments on the recording. 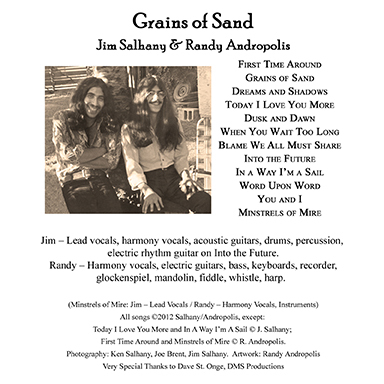 Grains of Sand was co-produced, mixed and mastered by Dave St. Onge of Digital Barn Studio (DMS Productions), Ransomville, New York. Randy has worked with Dave since 1978 in producing a number of CDs of various genres.